Survey finds you can't put a price on spending time with family. As the holidays quickly approach, many Americans are thinking about their finances. In fact, consumers estimate they will spend $967 during the holidays this year, the National Retail Federation reports. With people across the country poised to spend nearly a grand this Christmas season, GOBankingRates surveyed more than 2,000 adults to find out which is more important to them this holiday season: family or finances? Get the latest electronic (iPhone X, TV, etc.). The majority (57 percent) chose to spend Christmas with family. But, the second most popular choice might surprise you. Read on to find out which financial perk Americans found most appealing. Forget about getting an iPhone X — the financial benefit Americans most want is to have their credit card debt erased. Almost 12 percent of respondents chose this option over seeing their families during the holidays. A previous GOBankingRates survey found that debt is the No. 1 cause of financial stress in the country versus other expenses — including housing, healthcare and everyday costs — so this response is not surprising. After all, many Americans are dealing with as much as six figures in debt. Another survey found that the average overall debt amount for Americans surveyed — including those with no debt — is approximately $63,000. However, among respondents with debt, the average total amount owed is $140,113. The next most popular choice is getting a free three-day vacation of your choosing (8 percent), followed by free housing for a month (6.9 percent) and free groceries for a month (6.8 percent). Only 6 percent of survey respondents opted for the holiday bonus, while only 3 percent want to get the latest electronic over spending quality time with loved ones. 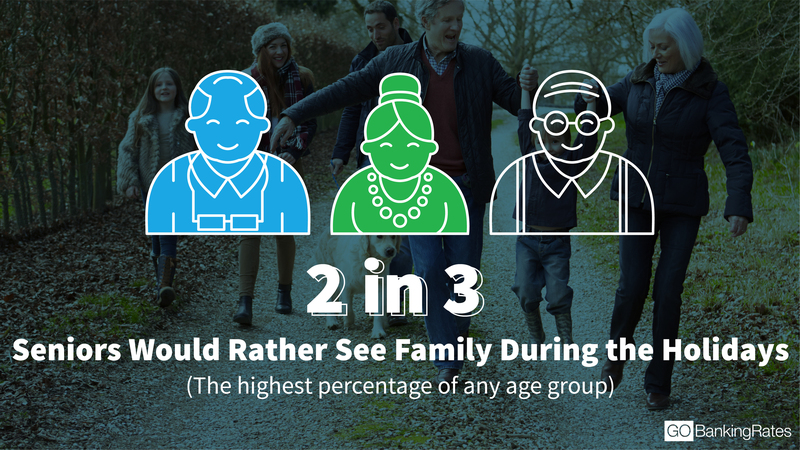 Among all age groups, the most popular answer is “I’d rather see my family members during the holidays,” with seniors age 65 and over more likely to choose this option than any age group. But among the respondents who opted for spending Christmas without family for a financial benefit, all ages chose erasing credit card debt as their top choice. However, other choices varied by age group. Among the 18-to-24 set, credit card debt was the No. 1 answer (22 percent), but free housing was a close second (20 percent). Rent is commonly the single largest expense for young adults who are moving out on their own for the first time, so this seems like a logical choice for this age group. All age groups from 25 to 54 chose a free three-day vacation as their next choice, after spending time with family and getting their credit card debt erased. 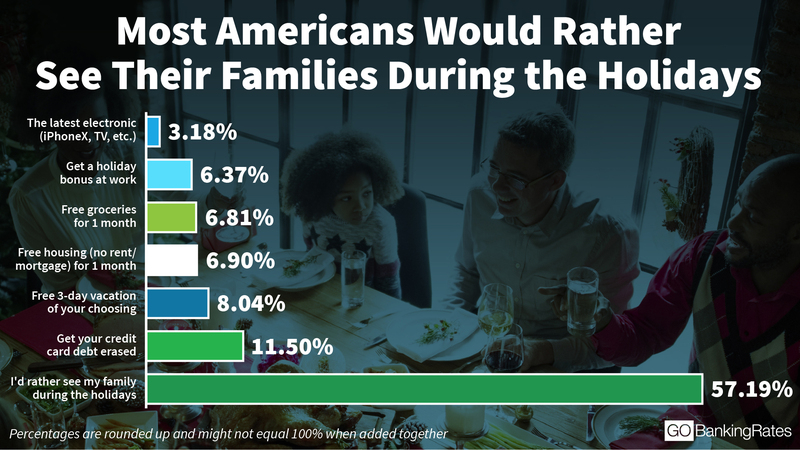 Those in the 25-to-34 age bracket chose “I’d rather see my family” the least (49 percent), while those over 65 chose the option to see family the most (67 percent). Nearly one-third (32 percent) of 45 to 54-year-olds who were willing to give up family for a financial benefit chose to erase their credit card debt. Over one-third of people in that age group struggle with credit card debt, which could explain why so many made that choice. A previous GOBankingRates survey found that 37 percent of respondents ages 45 to 54 have more credit card debt than money in their savings account. The “free groceries for a month” option appealed most to 55 to 64-year-olds compared with the other age groups, with 23 percent of respondents in that age group who chose a financial perk over time with family picking that option. A previous GOBankingRates survey found that people in that age range spent an average of $339 on groceries each month, which is actually less than what other age groups spend but still would be a nice payout. Respondents in the 55-to-64 age range cared the least of all the age groups about getting the latest electronic, with only 3 percent opting for new tech. 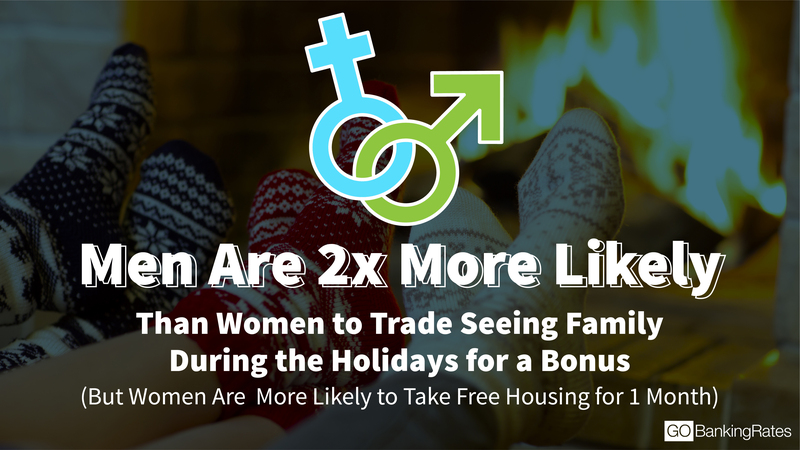 Once again, both female and male respondents who opted for spending the holidays without family for a financial benefit chose having their credit card debt erased over the other perks — but women chose this option more often than men. Twenty-nine percent of women who chose a financial perk over spending time with family chose erasing credit card debt, while 25 percent of men chose the same. A previous GOBankingRates survey found that women have more credit card debt than men, which could explain why a larger percentage of women made that choice. Women also chose free housing for a month more frequently than men, with 21 percent of women choosing this option compared to only 12 percent of men. In addition, a higher percentage of women chose the free three-day vacation, though the disparity between genders was less — 21 percent of women compared to 17 percent of men. After erasing credit card debt, most men opted for getting a holiday bonus, with 19 percent of men who chose a financial perk over seeing family choosing this type of benefit. Only 11 percent of women made that selection. Men also chose to get the latest electronic more frequently than women did — 10 percent of men made this selection, while only 4 percent of women did. Overall, Americans valued spending time with family during the holidays above any financial benefit. Clearly, many people believe the old adage that money can’t buy happiness. Those that did want a monetary perk overwhelmingly chose having credit card debt erased, which held true even when comparing respondents by geographical region, age and gender. Methodology: This GOBankingRates.com survey posed the question, “Would you rather see your family during the holidays, or…” and supplied seven possible answer choices to to 2,004 people among all 50 states and Washington, D.C.: (1) Get a free 3-day vacation of your choosing; (2) Get the latest electronic (iPhone X, TV, etc); (3) Get a holiday bonus at work; (4) Free housing (no rent/mortgage) for 1 month; (5) Free groceries for 1 month; (6) Get your credit card debt erased; (7) I’d rather see my family during the holidays. Responses were collected through a Google Consumer Survey conducted from Oct. 18, 2017, to Oct. 19, 2017, and responses are representative of the U.S. online population. The survey has a 3.70 percent margin of error.